Are your students obsessed with Serial or Undisclosed or other true crime stories? Pique their interest while exposing them to canonical literary fiction with Trifles... and it's written by a women, which is the perfect twist on this murder mystery, of sorts! 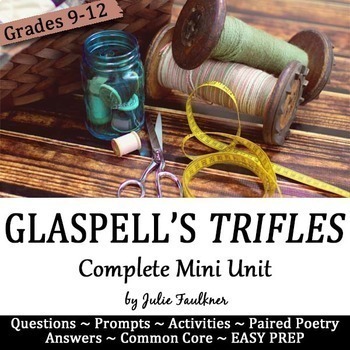 This unit plan provides an interactive plot chart review activity, a paired poetry study, two quote analysis activities, vocabulary words to note, active reading questions, symbolism activity, a narrative prompt, and an argumentative writing prompt. Many of the activities, as the essential questions suggest, focus largely on the skill of theme development and author’s choices in a drama. However, there are many ways to use this unit for a comprehensive study of this short story. Since it's first production in 1916, Trifles has become one of the most anthologized works in American theater history and is frequently cited as one of the great masterpieces of American theater. It is now rightfully considered a masterpiece of the early feminist movement. Students will enjoy the murder mystery feel of the text while digging deeply into the layers that are provided through the rich symbolism and ironic ending. 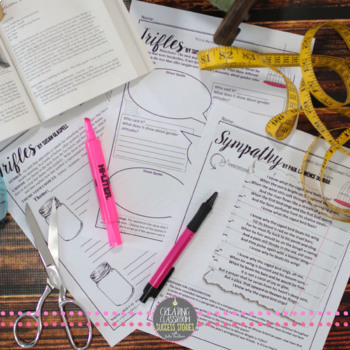 This short drama unit is an excellent choice if you are looking for a text to quickly cover the elements of drama in place of a longer text, or it would even work well for bringing in a quick unit for Women's History Month! No worries if you don't have a textbook with this play in it - I've included live links to the text, audio, and short film of it - all for FREE! That's the perfect solution whether you are a paper school or Google Drive school!